Peace Magazine v27n3p06: Egypt: The First Internet Revolt? Friedman appears to have had an either/or dichotomy in mind when assessing the Egyptian revolt that started in January 2011. That’s an oversimplification, ignoring not only the lack of opposition from the elites, military, and US government, but also the role of social media and the organized groups and informal networks that brought people to the streets. It’s clear that social media such as Facebook played important roles in transforming organized groups and informal networks, establishing external linkages, developing a sense of modernity and community, and drawing global attention. Their impact suggests that those concerned with the quest for democracy and peace should pay more attention to the explicit and implicit effects of these social media. the even wider proliferation of always-available mobile phones. The interaction of organized groups, networks, and social media was crystallized in the Egyptian revolt. Of course, Friedman is right: it wasn’t just the internet (and mobile phones), but at the same time, Friedman is wrong to downplay their importance. And he is wrong to use the image of “millions of Egyptians” presumably disconnected. The protesters were very connected in groups and networks. Although we focus on Egypt, what we have found appears to have happened in Tunisia and in Libya—albeit with a quite different outcome. Much of the Egyptians’ social media connectivity was via texting or accessing the internet on mobile phones rather than via personal computers. Their mobile access to Twitter and Facebook was particularly precious when the regime blocked access from personal computers. For example, Yara Adel El Siwi (@YaraElSiwi) tweeted on January 26, 2011: “You who have Twitter and Facebook workin on ur phone, use ‘em to spread words of hope. We won’t let this end here #jan25 was just the start.” These mobile phones could easily be carried and concealed, and by tapping into streetlights, recharged. One survey found that 29% of Egyptian adults had some internet access, mostly at home, although disproportionate surveying of affluent neighborhoods may overstate the percentage.10 And if people did not have their own internet connection, it is probable that among urban Cairo men, they had friends and relatives who did. Social media came more directly into play with The April 6 Youth Movement, a more recently established political group that contributed to the Egyptian revolt. For example, Ahmed Maher—a 30-year-old civil engineer and one of the cofounders of the April 6 group—had engaged in political movements as early as 2005.12 The young activists employed mobile phones, digital cameras, and the internet to extend their anti-autocracy movement to the blogosphere.13 After a strike in the Nile Delta city of Mahalla in March 2008, Maher and others created the “April 6 Youth Movement” as a Facebook group to promote a national strike on that date. Although security forces suppressed the event and arrested Maher, the Facebook group continued to be widely followed.14 Following the success of the Tunisian uprising in January 2011, representatives from the youth movements, the youth wing of the Muslim Brotherhood, and other political activists and parties cooperatively plotted the nonviolent anti-Mubarak protests. They announced the protest sites online and used Facebook to mobilize the demonstrations.15 Social media offered affordable access to social movements by reducing the costs of mobilization and organization and accelerating the dissemination of information. But, this doesn’t mean that Friedman was right in scoffing at the internet. Once we get past either/or thinking, we find that social media has expanded the traditional word of mouth to inform a range of people broader than the kinship and friendship networks. For example, Amr Bassiouny, a young activist in Cairo, wrote on his Twitter feed on May 26: “Starting points for tomorrow’s Rallies! All Head to Tahrir! http://on. fb.me/mgez1d SPREAD SPREAD SPREAD RT PLZ #Egypt #jan25 #tahrir” (The link refers to an Arabic Facebook page to promote the protests on May 27, 2011). This tweet was broadcast directly to his more than 3000 followers and indirectly to a larger audience when 26 of his followers forwarded it to their own followers. In addition to being involved with organizational and social network activity, social media distinctively contributed to the revolt by stimulating the growth of a sense of modernity. Although only 24 percent of Egyptians used the internet in 201020, this percentage was not randomly distributed. The internet users were predominantly the young adult Cairo men who were at the heart of the revolt. The young activists recalled that social media was naturally integrated into their movement.21 They pronounced themselves as “the Facebook generation,” signifying that they were no longer the non-modern Egyptians of the past.22 A widely distributed picture during the revolt showed a Tahrir Square revolutionary holding a sign saying “Facebook” for both local and Western media to see,23 and months after the revolt, Facebook T-shirts in English and Arabic are widely sold by Egyptian street vendors quick to respond to popular trends. In a repressive society, there are dangers that each person fearfully thinks that he or she stands alone. Social media helped to build a sense of community and minimize this feeling of isolation. Social media became platforms where discontented Egyptians could voice their frustrations, share relevant expertise, spread hopes, and overcome the fear that comes with living under the oppressive regime.25 When police officers beat to death Khaled Said, a 28-year-old Egyptian businessman, in June 2010, cries of police brutality and public outrage erupted online, especially after someone created a Facebook page called “We Are All Khaled Said.” Several people, who apparently did not initially know each other,26 posted photos taken from a mobile phone of Said’s beaten face and created YouTube videos depicting Said as a happy individual prior to his death. 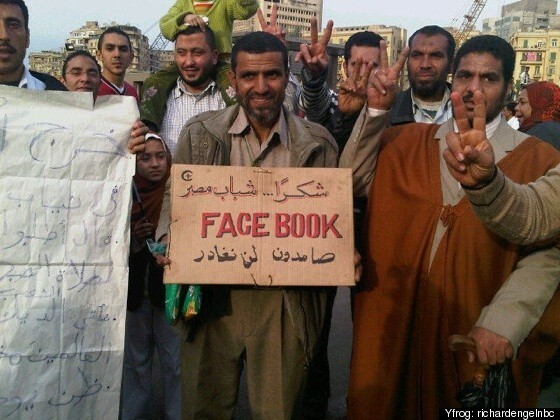 This Facebook group later helped to promote the anti-Mubarak demonstrations. As of June 2011, it has more than 1.3 million supporters on its Arabic page (and more than 100,000 on its English page), widely disseminating updates about the revolts in Egypt and the Middle East-North Africa region. Communities are also strengthened by spreading news, hope, and help on Twitter. Thus Farah Wael, an Egyptian living in Paris, wrote on Twitter on January 26: “In case of arrest call those numbers for legal help : 0123112420 0106574724 0122222672 25310027 Retweet please #25jan #jan25.” This message was been retweeted by 65 others to offer legal help for more people. Wael’s tweet shows how social media outside of Egypt played a significant role in the revolt. Egyptians, other Arabs and those living abroad were involved. The realities of dictatorships are often underreported in countries with state controlled mass media and restrained freedom of speech. While local media dare not report, foreign media are often not interested. Karim Marold’s tweet, on January 27, 2011, illustrates the local underreporting of the Egyptian revolt before Mubarak’s overthrow: “boycott: do nt buy the national newspapers for the nxt 3 days, since they r nt covering the whole truth (al ahram, al akhbar, al gomhooria)”. However, social media enabled citizen journalists to circumvent the monopoly of state media, resist state censorship, broadcast personal experiences worldwide, and access alternative news sources. In addition to writing in Arabic, many used English to reach audiences outside the Arab world. The English in the signs we show in this article illustrates this prevalent use. Many protesters wrote in English on Facebook and Twitter, and held up signs in English during protests. For example, Karim Marold sometimes summarized and tweeted reports from CBC News and sometimes broadcast news on his own. On May 27, 2011, he tweeted from his BlackBerry at the site of the Cairo protests, “Rally going to #tahrir from mostafa mahmoud [square] #May27 #Egypt,” and attached a photo of the rally to his tweet. People outside Egypt followed the revolt and communicated with insurgents inside to collect stories. An analysis of more than 3 million tweets containing six popular hashtag codes relevant to the Arab revolts, such as #egypt and #sidibouzid (Tunisia), found that the major spikes in usage were driven by tweeters living outside of the Middle East,27 although our study of some tweeters suggests that they were expatriates. Internet-connected Egyptians were aware of this global attention and, thus, strategically voiced their concerns. The integration of social media into social movements illustrates the turn towards networked individualism among the young urban men. The Egyptians in Tahrir Square do not appear to be the traditional members of densely knit, self isolated villages and neighbourhoods. Rather, the young men were able to use social media and mobile technologies to access large and diversified networks, reach beyond physical and social boundaries, and exploit more resources to potentially bring about social change. Barry Wellman is a professor, Dept. of Sociology, University of Toronto. Justine Yu is a recent graduate and Xiaolin Zhuo is a current BA student. 1 We thank Bernie Hogan, Katy Pearce, Lee Rainie, Yu Owen Song, and Zeynep Tufekci for their advice. We dedicate this essay to the memory of Charles Tilly. 2 We conservatively call what happened in Egypt the “Egyptian Revolt” because as of our writing in June 2011, the alternative terms – “Arab Spring” and “Egyptian Revolution” – we do not assume that the events were a fundamental change in Egyptian society: elections are imminent, but the military and other elites retain much power. 4 Rainie, Lee and Barry Wellman. 2012. Networked: The New Social Operating System. Cambridge, MA: MIT Press. 5 Lerner, Daniel. 1964. The Passing of Traditional Society: Modernizing the Middle East. Free Press; Davies, James C. 1962. “Toward a Theory of Revolution”, American Sociological Review, 27(1), February, 5-19. 6 Tilly, Charles. The Vendée: A Sociological Analysis of the Counter-Revolution of 1793. Cambridge, MA: Harvard University Press, 1964; Tilly, Charles. “Collective Violence in European Perspective.” In Violence in America, edited by Hugh Graham and Tedd Gurr, 4-45. Washington: U.S. Government Printing Office, 1969. 7 Tarrow, Sidney. 2011. Power in Movement: Social Movements and Contentious Politics. Cambridge: Cambridge University Press; McAdam, Doug, Tarrow, Sidney, and Tilly, Charles. 2001. Dynamics of Contention. Cambridge: Cambridge University Press. 8 Fisher, Dana R and Marije Boekkooi. 2010. “Mobilizing friends and strangers: Understanding the role of the internet in the Step It Up day of action.” Information, Communication & Society, 13(2), March, 193-208; Hampton, Keith. 2011. “Comparing Bonding and Bridging Ties for Democratic Engagement: Everyday Use of Communication Technologies within Social Network for Civic and Civil Behaviors.” Information, Communication & Society, 14(4), 510-28. 9 Howard, Philip. 2010. The Digital Origins of Dictatorship and Democracy: Information Technology and Political Islam. New York: Oxford University Press. 16 Williams and Associates, “Egyptian Public Opinion Survey April 14-April 27, 2011.” Washington: International Republican Institute. http://www.iri.org/news-events-press-center/news/iri-releases-egypt-poll; see also Borkan, Brett. 2011. “TV, Not Internet, Main Source of Information for Egyptians During Jan 25 Protests, Says Poll.” Cairo: Daily News Egypt, June 7, 2011. http://thedailynewsegypt.com/people/tv-not-internet-main-source-of-information-for-egyptians-during-jan-25-protests-says-poll.html. We repeat our cautions about the accuracy of this survey. 17 Spencer, Metta. 2010. The Russian Quest for Peace and Democracy. Lanham, MD: Lexington. 20 Arab Social Media Report 1, 1. Dubai: January 2011. 21 Tufekci, Zeynep. 2011. Email “Tunisia/Egypt preliminary thoughts.” March 14. 30 Tufekci, Zeynep. 2011. “Agents of Change.” Presented to the Personal Democracy Forum, New York, June. Keith Hampton (2011) has just shown similar dynamics in American society. See his “Comparing Bonding and Bridging Ties for Democratic Engagement.” Information, Communication & Society, 14(4), 510-28. 31 Tufekci, Zeynep. 2011. “Military has been calling prominent bloggers for ‘questioning’ – so far, they haven’t been arresting them. Still, worrisome.” Tweet by @techsoc. June 2. 32 Eltahawy, Mona. 2011. “Rewriting the Narrative of the Middle East.” Luminato Festival, Toronto, June 12. Peace Magazine Jul-Sep 2011, page 6. Some rights reserved.